Istria Outside My Window: Christmas wheat -- and holiday greetings! Christmas wheat -- and holiday greetings! 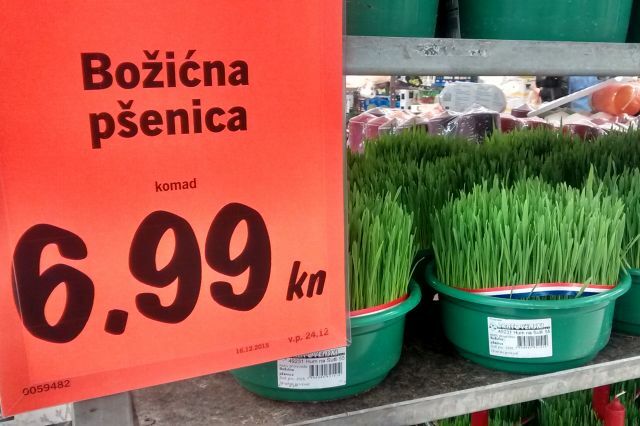 The tradition of božićna pšenica (Christmas wheat) was not one I was familiar with before moving to Croatia. But every year around mid-December I notice these curious plants for sale in supermarkets and on display at neighbours' homes – that look to me a lot like cat nip! I did a bit of research and found out that the wheat grains are planted on December 13th, the feast of St. Lucy. According to the tradition, if by Christmas Day the shoots of wheat have grown tall, abundant and green, then its owner will have a prosperous New Year! Now what I'm confused about is the fact that fully grown Christmas wheat plants are for sale everywhere. Wouldn't this be cheating, if you haven't planted it yourself? Does this mean that you're guaranteed to have a fantastic New Year if you buy a fully grown plant? I would love to know. Here's wishing all my readers Happy Holidays and a prosperous 2016! May your wheat grow tall and lush!